Besides ornamental grasses, I’m partial to robust hardy perennials that are easily propagated, low maintenance, and, work hard for their keep for as many months as possible. 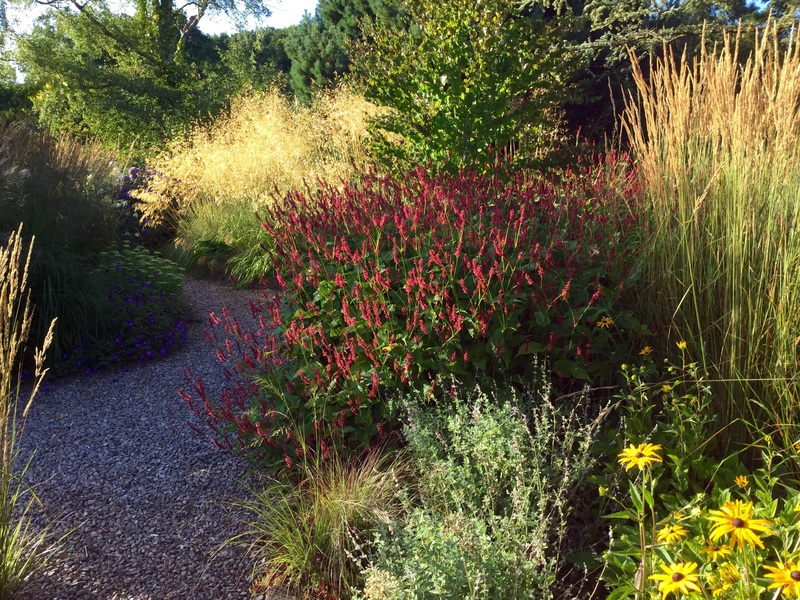 Persicaria is a firm favourite not least because the genus come in such a range of shapes, colours and sizes. Just like hats, there’s one for every occasion. 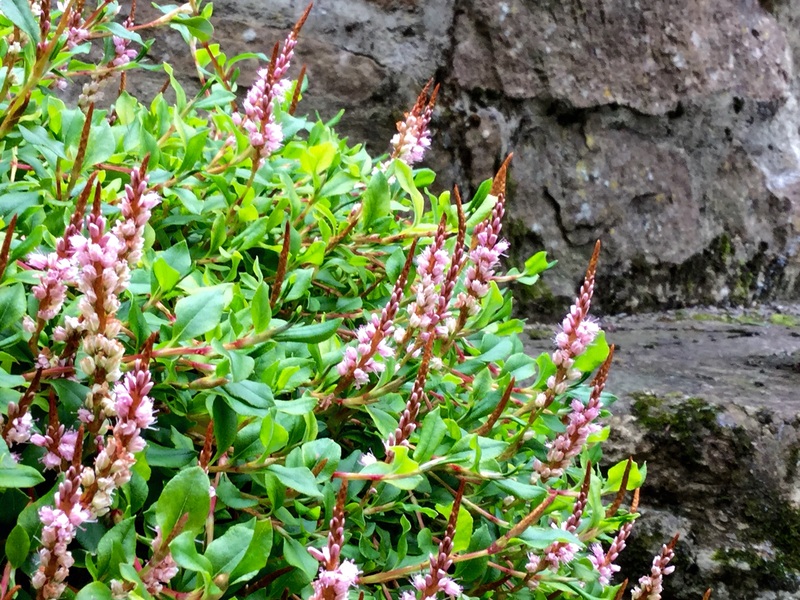 The rockery form Persicaria vacciniifolia AGM has fine glossy leaves and a neat habit, cloaking pots at the base of the stone wall of the lower terrace in front of the house it gives us something to look at from the kitchen table throughout the year. Characteristic pink bell shaped flowers arranged in dainty candles are produced from late summer right up until the frosts. 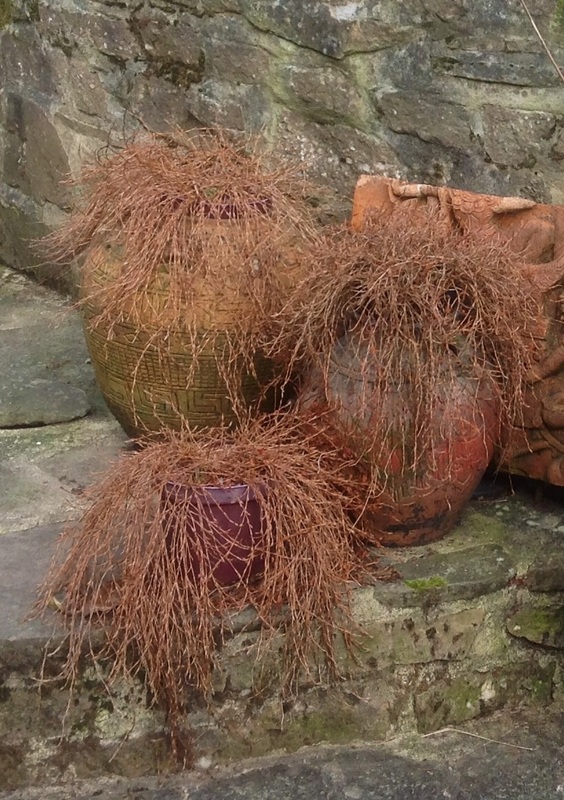 In winter the wiry rusty coloured stems hug the side of the pots before sprouting new leaves along their length in spring. The winter garden of cornus and silver birch is a thicket from summer until spring, low growing Persicaria affinis carpets the ground suppressing the weeds. In early spring when the cornus is stooled it proves its worth as a trample proof plant. Both earned The Royal Horticuitural Society’s Award of Garden Merit, I can see why, even the arid edge of the drive doesn’t seem to faze this plant. To one side of the drive in the dry shade of a mature blue cedar is a large clump of a stunning form Persicaria polymorpha, recently renamed ‘alpina‘. 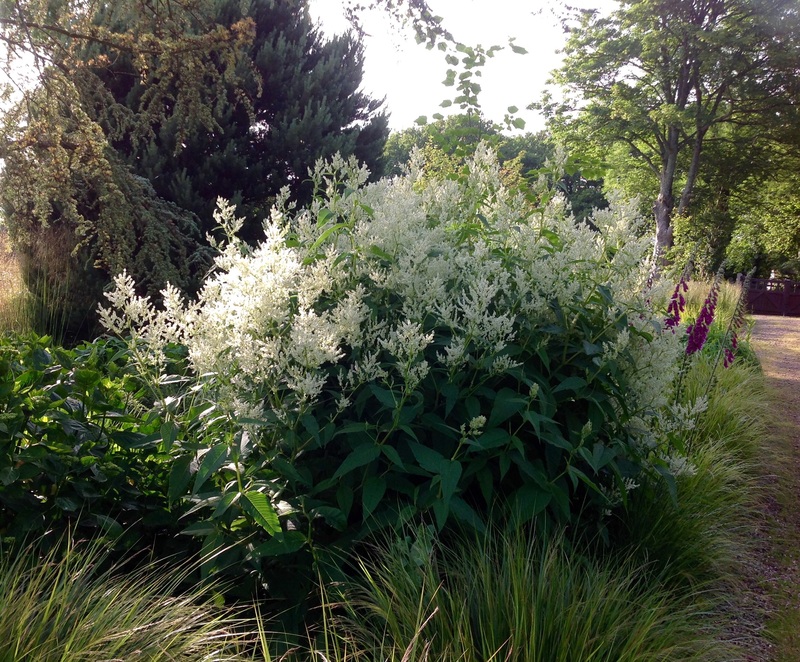 The Giant fleece flower as it’s commonly known, is the Goliath of the family, a sub shrub standing at 5’ in height and producing amazing plumes from midsummer that start off glowing bridal white in June. At this stage they make dramatic cut flowers. In late summer the white takes on a pinkish blush, then as autumn sets in pink fades through red and bronze. The kaleidoscopic display is accompanied by other changes of a less lovely nature, in hot sunny spells there is a whiff in the air of the sort that causes me to curse the neighbourhood tomcat. Perhaps this makes it a good back of border plant. 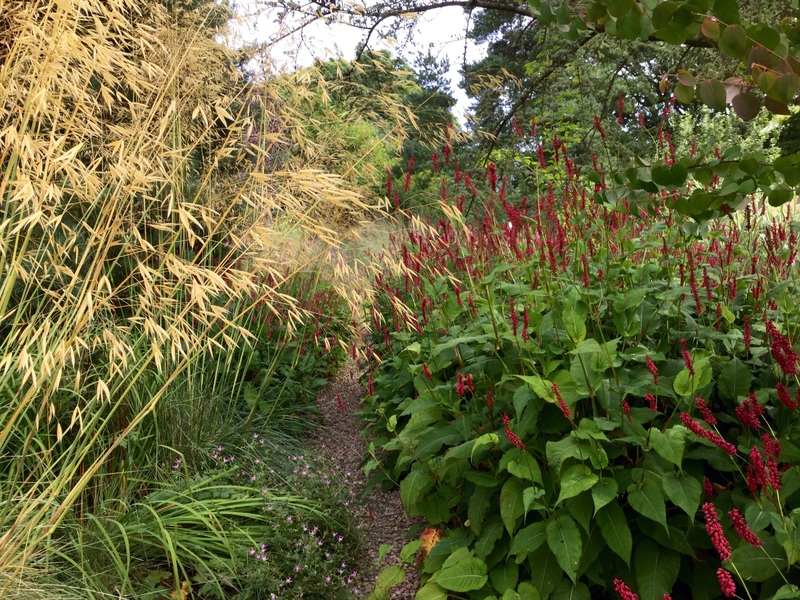 At about the same height, Miscanthus sinensis ‘Cosmopolitan’ happily rubs shoulders with the persicaria, the grass props hollow stems up against the strong gusts of wind that sweep up the valley. I’m slowly learning to appreciate Latin names for being helpful as well as tongue twisting. 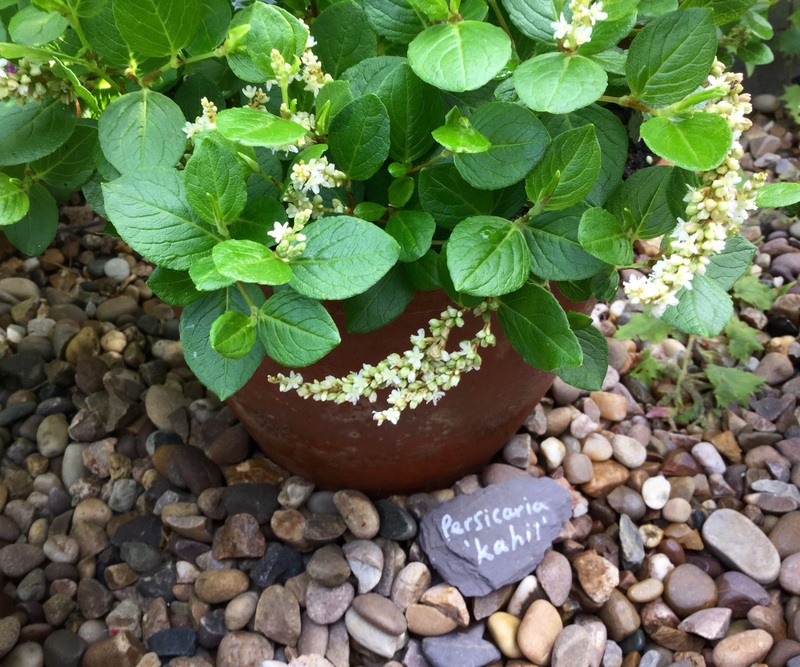 Persicaria belong to the Polygonaceae family, from ‘poly’ and ‘gonu’ meaning ‘many knees’, and are named for stems that have numerous nobbly leaf joints. It delights me that those with hollow stems are brought to their knees by frosts saving me the bother of cutting them back. 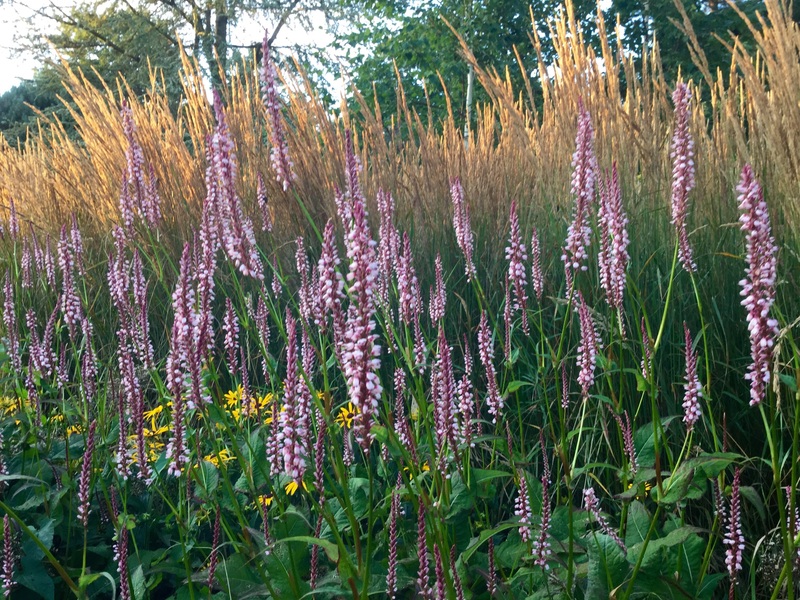 Persicaria amplexicaulis is the perfect partner for ornamental grasses, modern breeding programmes are providing exciting new cultivars with variations of colour from pure white, pinks, orange and reds. Good new ones I’ve tried are the red ‘Taurus’ and ‘Fat Domino’, and a promising dwarf ‘Pink Elephant’. On the main corner of the grasses terrace Periscaria amplexicaulis ‘Rosea’ glows in evening shadows and is a strong enough pink not to look washed out in direct sunlight. 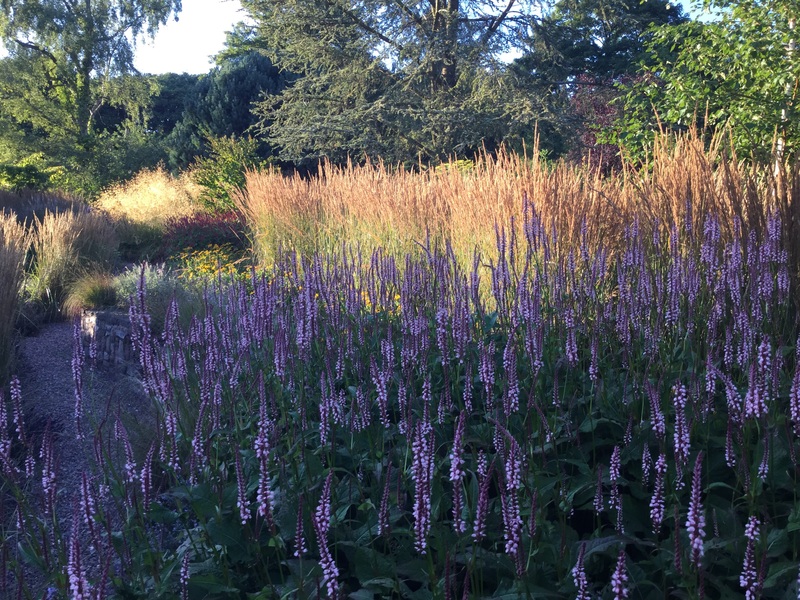 As sizeable plants persicaria amplexicaulis occupies a good few feet of ground, excellent value for filling larger areas with drifts of late summer colour. 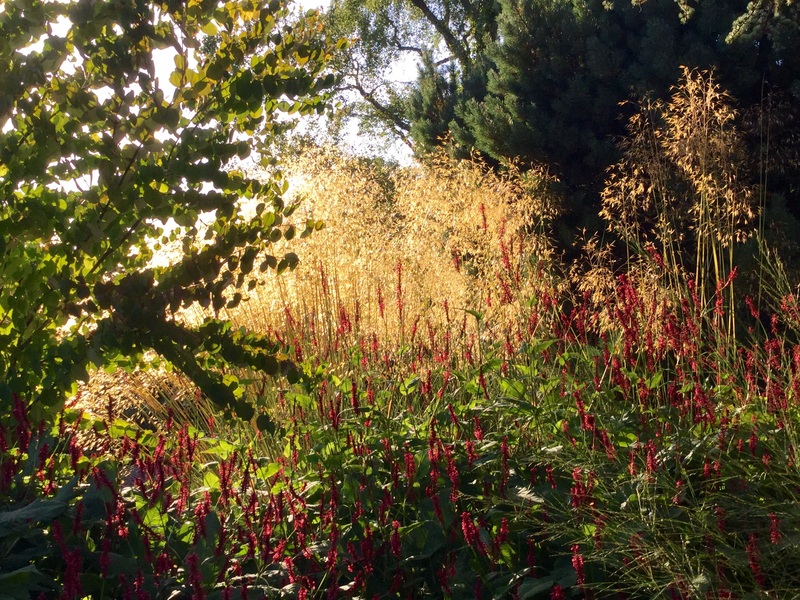 At the other end of the terrace is a crimson blaze of Persicaria amplexicaulis ‘Firetail’. A few plants have quickly filled the space and there’s a steady supply of seedlings. This is as close to being a nuisance as any of the species I grow get, otherwise they stay where they are put albeit in roomy quarters. Others that don’t seed are easily propagated from basal or stem tip cuttings, the latter can be rooted in water. Persicaria is beloved by bees, hover flies, butterflies and wasps. At this time of year there’s a whiff of caramel in the air thanks to the young Cerdiphyllum (on the left) around which ‘Firetail’ is planted, perhaps this makes it a magnet for wasps? Whatever the allure, the corner thrums angrily with swarms of the ‘drunk and jobless’ wasps and we avoid using this narrow path for a few weeks. 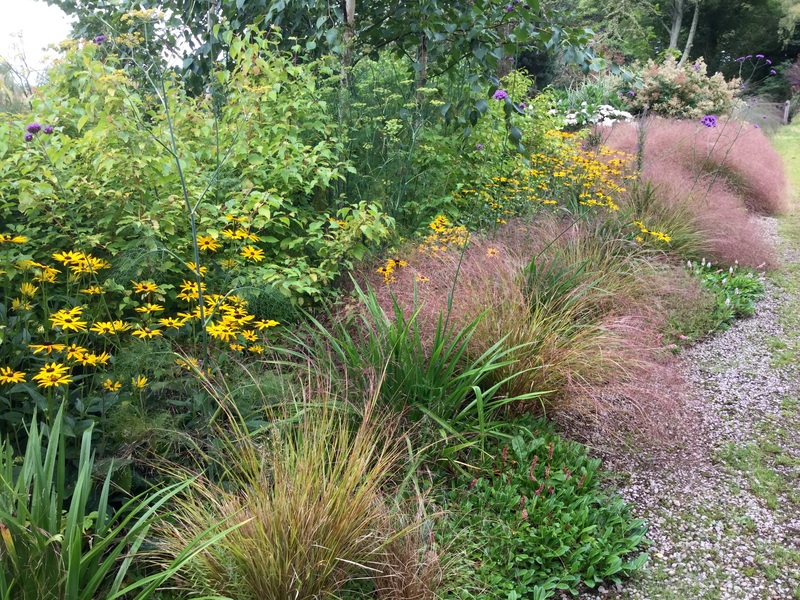 Seedlings from ‘Firetail’ weave among grasses and hydrangeas in a newly planted border designed to conceal the fencing and gate posts at the top of the drive. In time some of the planting in this bed may need thinning out, while we wait for the shrubs to establish it’s a pretty confection. Some species have less showy flowers but wonderful livery such as the well behaved and choice cultivar Persicaria microcephela ‘Red Dragon’. The silvery chevrons on a red background are either more or less pronounced depending on the amount of sun/shade. I like the way the gangly stems climb through neighbouring shrubs and I’m grateful that it hasn’t mugged Geranium ‘Lambrook Gillian’. The unsupported mass planted at the bottom of the orchard are inclined to sprawl like bar room brawlers across the border by late July. I’m told they could be given the Chelsea chop between mid May and early June, and they’ll need to be to spare the day lilies from being smothered next year. 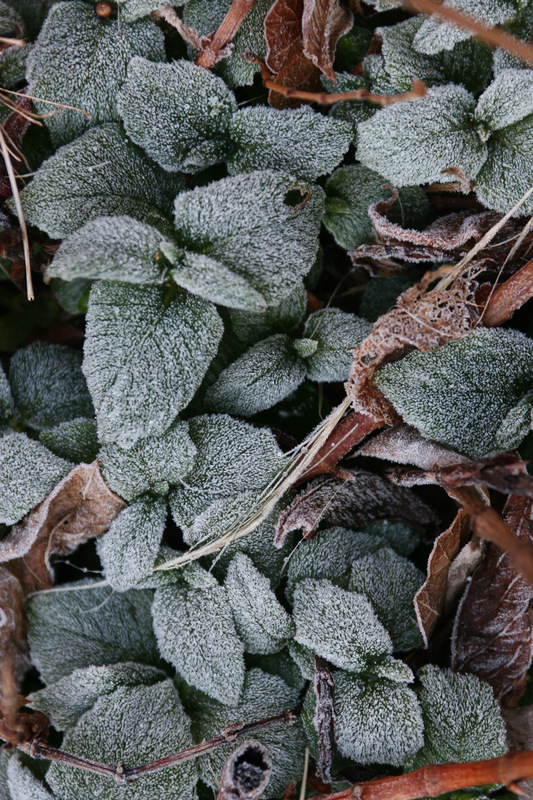 Until last February I hadn’t noticed the fine rosettes of new leaves of Persicaria campanulata, rimed with frost they caught my eye. Apart from the creamy white racemes of bell shaped flowers, Persicaria ‘Kahil’ doesn’t resemble any other persicaria I’ve encountered. I’ve not been able to find out very much about this plant other than it seems a bit of a rarity. The RHS lists stockists, the closest to me is Cotswold Garden Flowers. Looking demure and so charminginly displayed at Mulberry House garden on a recent Goodrich Gardens NGS Open Day, I’m sure it was winking at me. This is a great, timely review for me. I am just expanding experience of Persicaria. Last weekend I bought a ‘Red Dragon’ and I was wondering exactly how hardy it is. Also I am growing P. orientalis for the first time this year and it finally flowering now, but I can’t decide if I like it or not. I do really like your potted P. vacciniifolia though. Thanks for this. Thank you, I enjoyed writing it. ‘Red Dragon’ is a great plant I hope you enjoy it as much as I do. 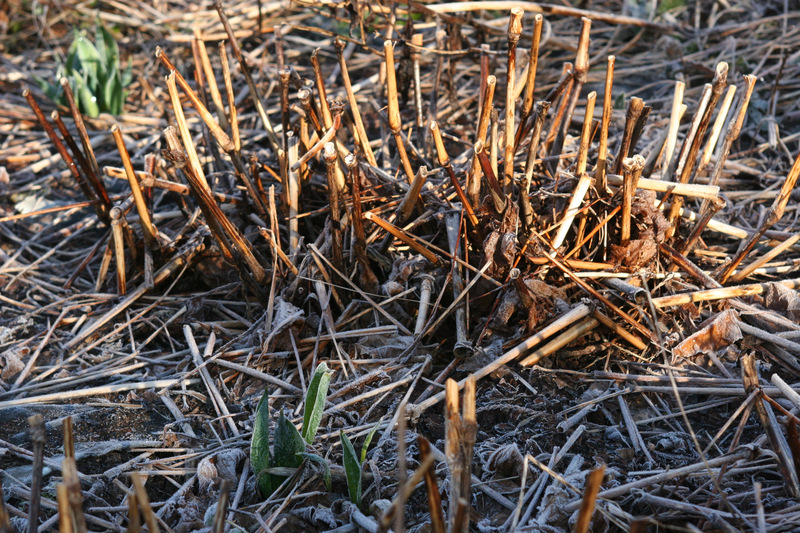 It’s hardy here on the Welsh borders, if you’re concerned maybe root stem cuttings in water. ‘Orientalis’ isn’t an annual I’ve tried but I might just for the fun of growing a plant with the nickname ‘Kiss-me-over-the-garden-gate’. I love that opening persicaria tumbling from pots; a new one to me, and rather alluring. I finally added my first persicaria to the garden this summer, P. affinity Darjeeling Red, which seems to be settling in well. Firetail is on my wish list, and I also love the towering plumes of annual P. orientalis, which looks spectacular in the borders at Gravetye and Great Dixter. I did sow seeds the autumn before last but the seedlings later succumbed to aphid attack and didn’t make it into flower, definitely one to try again though. It’s a delightful plant, in a few weeks the leaves will take on orange tints. 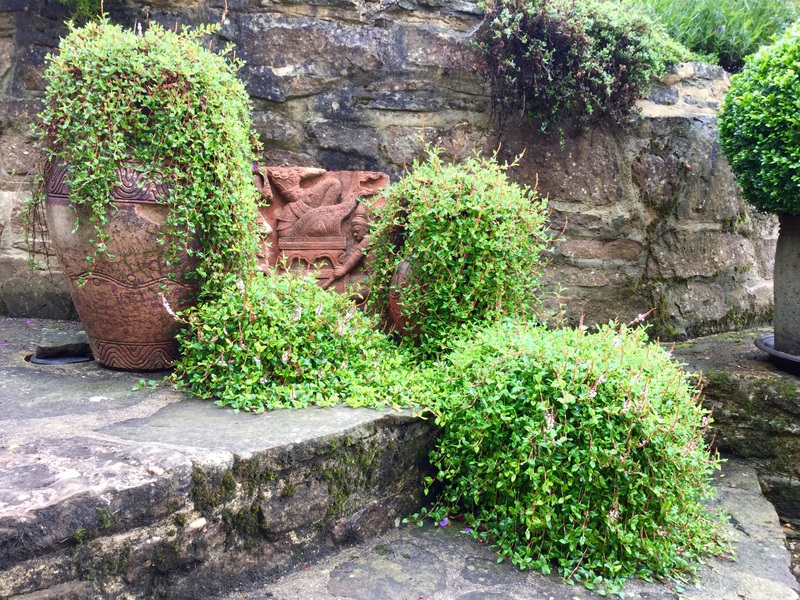 I’ve heard it can be semi evergreen, but isn’t for me grown in pots – I don’t mind, I like the rusty skeleton! ‘Darjeeling Red’ what a lovely name, perhaps redolent of its origins? I adore Persicaria and now I’m wondering why I haven’t put more of them up on the bank. There is one, P. amplexicaulis ‘Black Field’ which is a sort of crimson colour. It’s on a part of the slope where weeds have taken over but it seems to be holding its own quite nicely! I saw P. alpina at the weekend at a garden we visited. Wow! I love the idea of the changing autumn colour in the blooms but not sure I have the space for one at the moment and we were told it can be invasive. Related to knotweed I gather! ‘Blackfield’ looks wonderful, I’d like to try it. 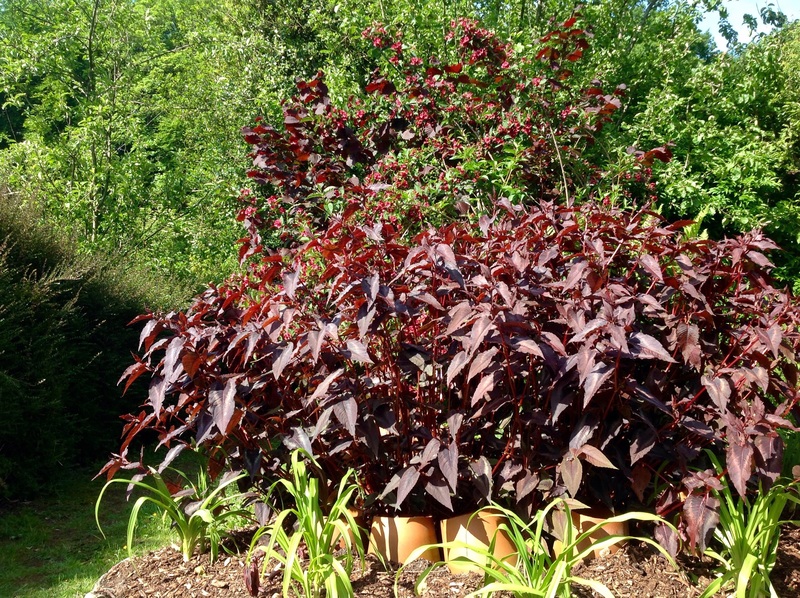 Seems a good addition to your amazing slope, I love the fine form of Persicaria virginiana in one of your recent posts. ‘Alpina’ is a big plant, the three I planted in 2012 have stayed put. Proportionally the low growing vacciniifolia has spread further but I wouldn’t say it was invasive. I believe those to watch out for/use with great care (if at all) as they’re slightly to moderately ‘invasive’ include capitata, wallichii, and the straight species microcephela – named cultivars of microcephela are fine. I love Persicaria and you have a wonderful collection,. The plant combinations are as usual with you, so artistic. I particularly like P. polymorpha and P. rosea. I must try those two. You have such good taste in plants, I’m glad you like them too. Choice cultivars are released regularly maybe check out http://www.chrisghyselen – Google translates (phew! )- this is where the ‘field’ series come from. It’s an exciting, varied and addictive family of plants! They do better in my wind swept garden than tall forms of other prairie perennials that I love and admire in more sheltered gardens. 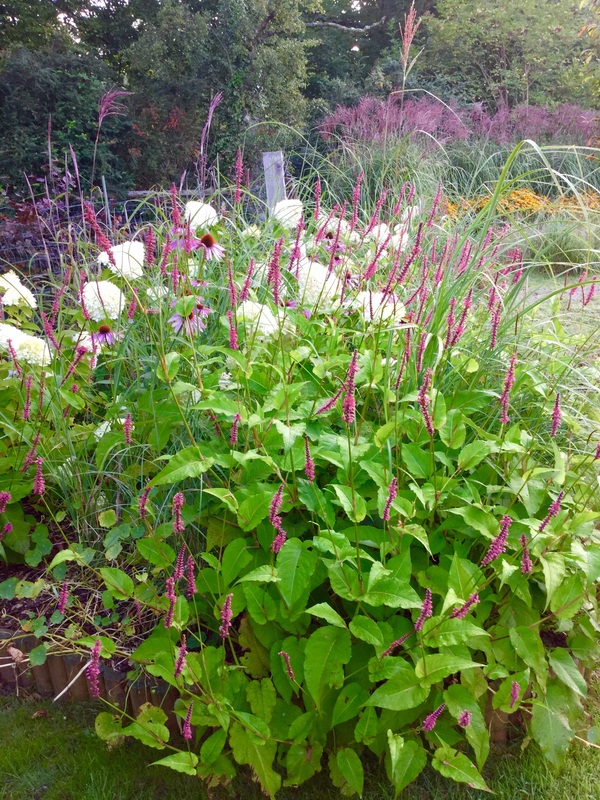 Persicaria slips by post…what a splendid idea! I don’t have Blackfield or I’d send you some. Specialist nurseries stock it, maybe order one online – being as tough as old boots they travel well. Taller forms with showy spikes make good cut flowers too Cathy. Such a helpful and as usual thorough and inspiring post. I’ve put it in my bookmarks file whilst I think hard about what species and where to plant. I’ve always loved persicarias but never planted any. Thanks. Thanks Sue, I’m blushing from your kind compliment! I hope you find a nice one (or two …) to add to your garden :). Wow what a great family! Love the way you have used them!! Spring here in NZ and just had a few days enjoying skeletal trees against blue skies, hundreds of lambs, huge magnolias and rhodos, tips of green on willows, our lovely yellow kowhai, our lovely white native clematis, snow capped mountains in the middle of the North Island, skiers, beautiful new greens. NZ so lovely I am lucky to live here. Came home to some dry pots so of course watered them before unpacking as any gardener would do! I love the percys as I call them. Great workers in the garden, good strong colour, form and brilliant for covering ground. I really like the way you have percy vacciniifolia in pots, a really great idea to try and I even prefer the Winter view. Funny how some plants wink at us, happens to me often! I like your nick name for them, it’s very appropriate, makes them sound like the dependable and unfussy chappies that they are! P. amplexicaulis ‘Firetail’. is a very different plant to affinis which is low growing, pink flowered form. 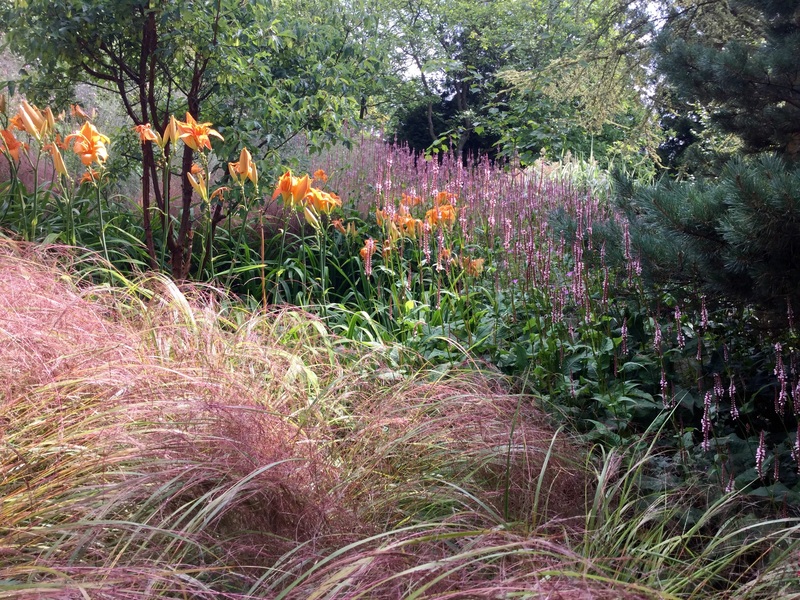 By post, suggest you try Knoll gardens, Crocus, or Beth Chatto. Self -seeds to species, unless fussy about varietal characteristics and not in a rush, you will only need a few. Now is a good time to buy Persicaria this way.